Our Secret Lives of Seven San Diegans feature is here, starting with the secret life of Joe Skoby! What amazing things can a fishmonger, a furniture store manager, a custom door designer, a graphic artist, a furniture maker, an engineer and a retired pro surfer really do? 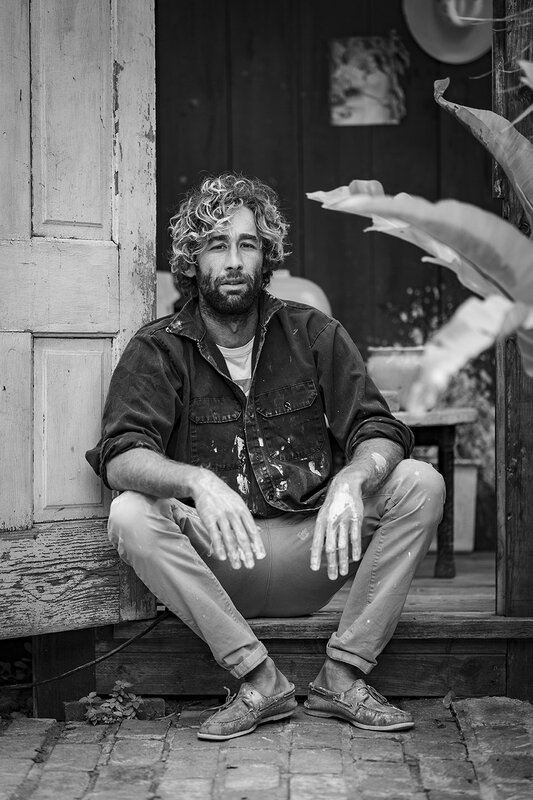 The pursuit of happiness and earning a living don’t always merge in life as joyfully as for Joseph Skoby who surfs, works and quietly makes art. Skoby, as his friends call him, has for years skillfully maneuvered a knife through the scales and bones of what is romantically referred to as the “fruit of the sea,” at El Pescador Fish Market in La Jolla. At first, he thought his job would be short-lived, allowing him to attend and finish school and giving him the flexibility to enjoy surfing. Instead, it slowly became the perfect permanent job—he still catches waves in his free time and also pursues his ceramics craft, something he first tried in high school. So 15 years later, he’s still happily fileting fish—and selling his hand-thrown clay creations (El Pescador was actually his first customer). Joe, all lean, bronzed skin and tousled sun-bleached hair, grew up in Newport Beach where, as a youngster, he became intimately connected to the ocean and body surfing. He didn’t get into board surfing until he was 17, “really rather late,” he notes. 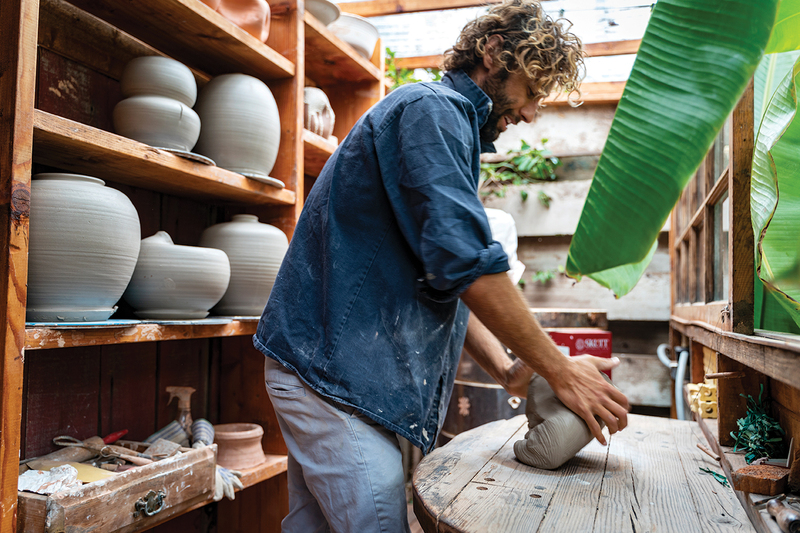 While in high school there, he took a ceramics class with a friend and was hooked, but for a few years it remained a hobby. 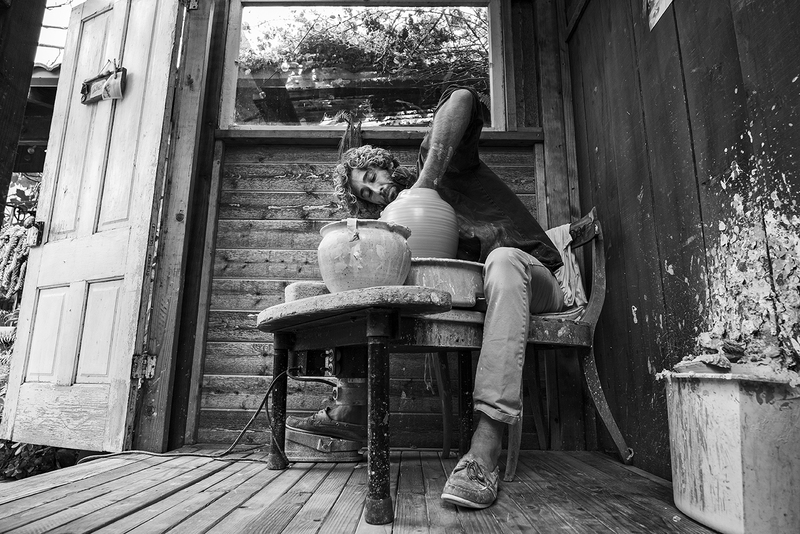 Joe Skoby molds clay in the narrow courtyard studio he built to spend time with his ceramic-making art. Joe relocated to La Jolla in 2004, where he had heard there was great surfing. 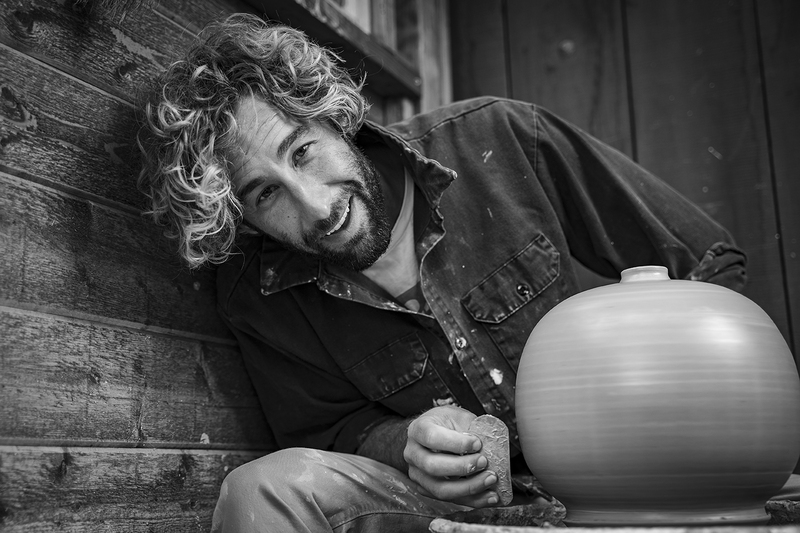 He enrolled at San Diego State University to finish his last year of college and also sought out the UCSD Crafts Center (now closed, but potentially slated to reopen in the future), where he rekindled his interest in working with clay. Renting a series of rooms and tiny beach cottages with the vestiges of old La Jolla, he came to love the town’s early art colony history, its community and character. “It has such soul,” he says. La Jolla’s also the place where Joe met his Italian-born wife, Cristiana, whom he married on the beach in 2009. All the while, Joe continued to experiment with ceramics. As he expanded the time he spent with his art, his family expanded too with the birth of his daughters, Solea, 5, and Francesca, 2. 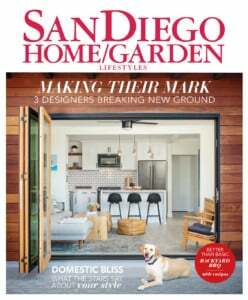 Three years ago the family moved to the Upper Hermosa area, making themselves cozy in a small 1930s adobe with a courtyard that Joe surrounded with lush plantings he started from clippings. 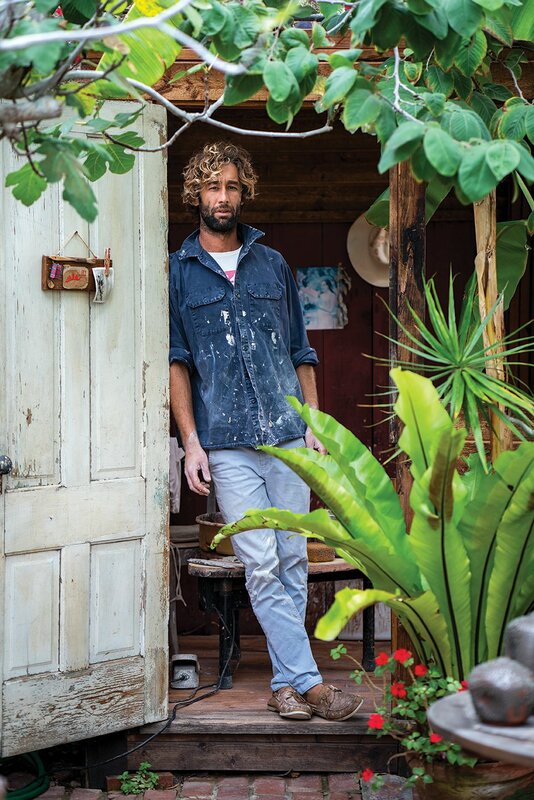 Off the courtyard, he built a narrow 6-by-18-foot recycled-wood lean-to, which became his studio. Tiny, one corner houses his electric potter’s wheel; another is home to a camellia bush and his electric kiln where Joe fires some of his creations. Shelves line a wall of drying vessels of many shapes. They stand in a row, patiently waiting the final test of heat. 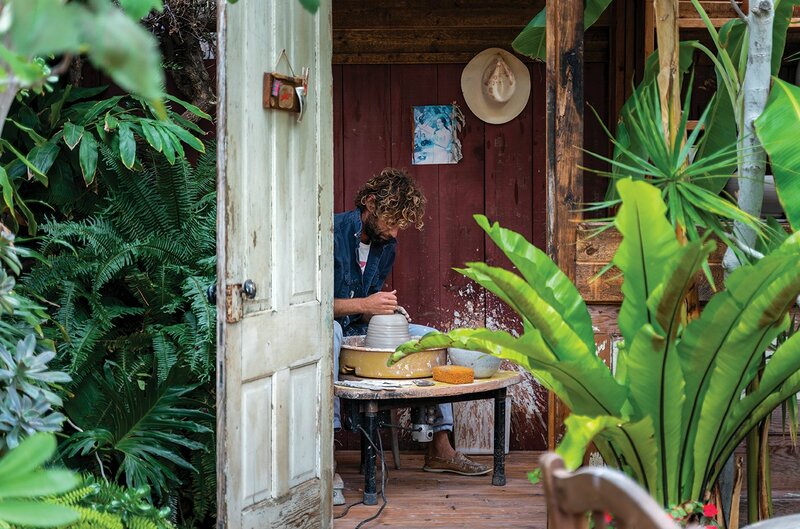 The studio’s corrugated plastic roof creates a lovely filtered light in the cramped space—especially in the morning, which is when Joe prefers to sit at the spinning potter’s wheel, either here or two steps out into the courtyard. “I strive for stripped down simplicity,” he says. 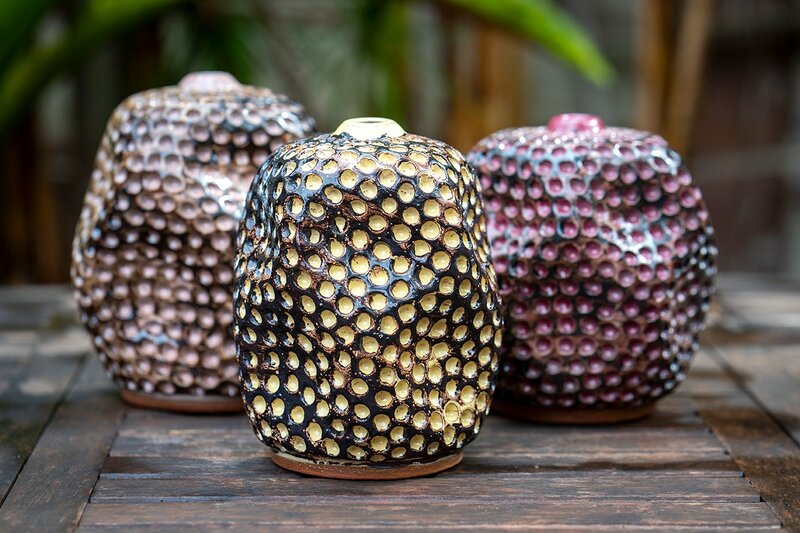 “Curves, texture and color” are his language in the earthy clay. A serendipitous meeting at El Pescador with customer Martha Longenecker, famed ceramicist and founder of the Mingei International Museum, later led to his use of her gas kiln, which the family bequeathed to him along with some tools when she died in 2013. “The gas kiln allows for more control, higher firing temperatures,” Joe says. 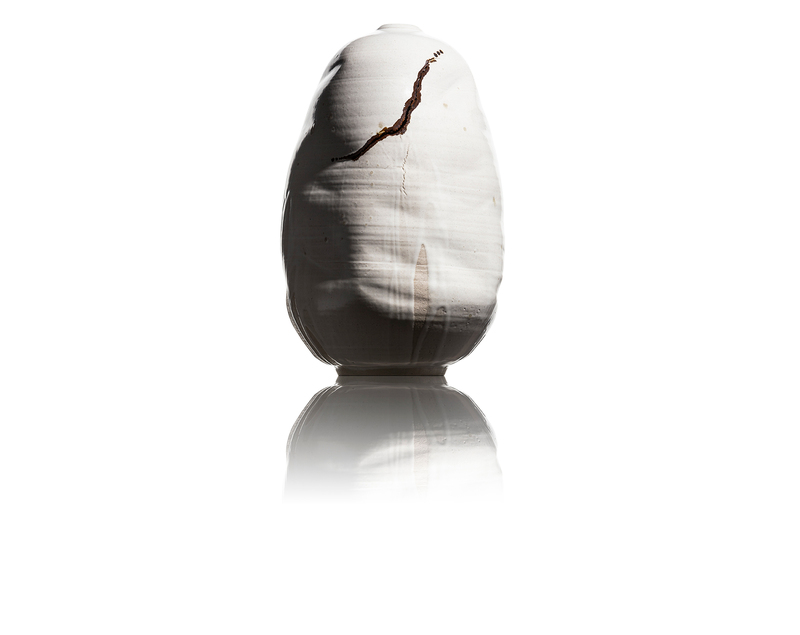 Glazes are hand-dipped, sprayed on or hand-painted, but in the intense heat of a kiln, results can produce a surprise. Now he uses a different gas kiln but the tray of her tools are what he uses daily, like a kind of blessing on his art, trimming, gouging and fashioning his signature textures. 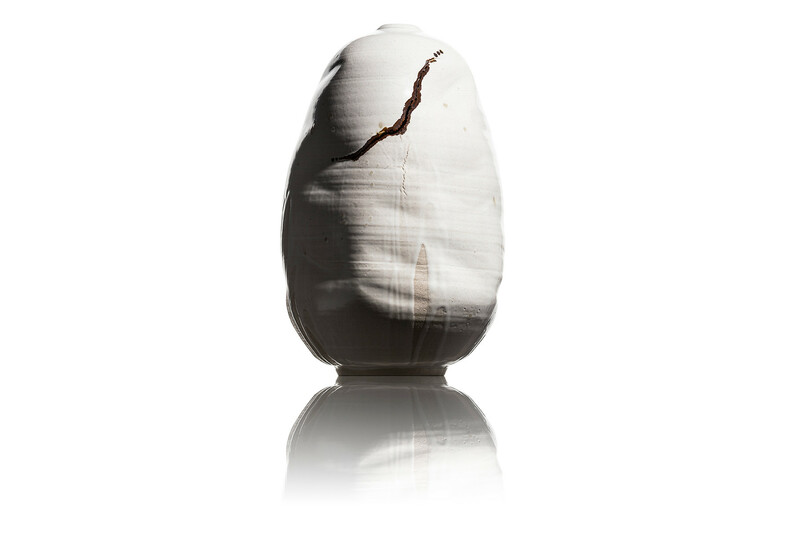 His intense focus is silent, whether in the arc of an incredible wave or the curves of his ceramics. 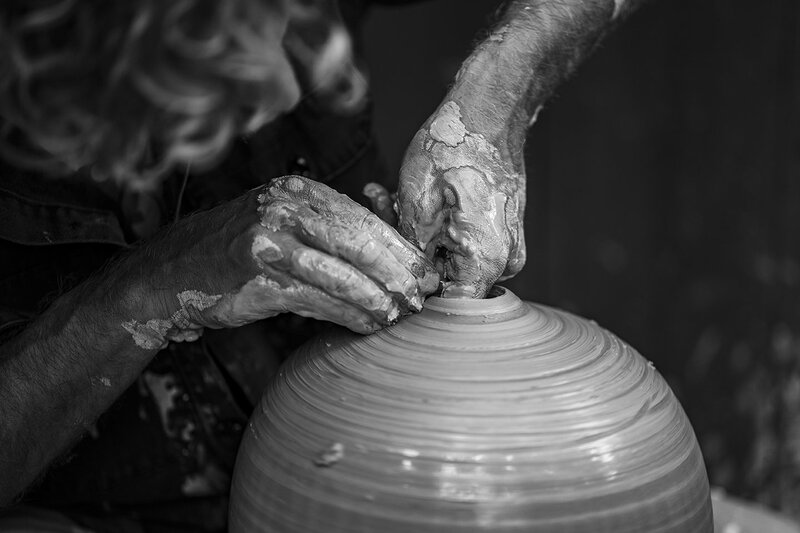 At the potter’s wheel, unruly curls fall around his close-set eyes and elongated, pointed face as long, sensitive fingers caress the sensuous, wet, red clay. “It’s so elemental,” Joe emphasizes. Textured with a touch-of-hand pattern, Joe’s pieces almost abandon their functional purposes to become sculptures on a shelf. Last August, The Athenaeum Music and Arts Library in La Jolla chose one of Joe’s pots for their Annual Juried Exhibition. These days, he steadily follows his bliss and finds pleasure in the balance of work, surfing and ceramics.